I’m not a big fan of copy cat recipes, because, let’s be honest, the secret ingredient in commercial baked goods is preservatives, which neither Publix nor Kroger sell. Still I get sucked in by the beautiful blog photos and the idea that I could make my very own Hostess, Little Debbie or Starbucks treat. Mostly because it feels like it would only be half as bad for me if I made it myself. Hey, if there aren’t any preservatives, that could be half true. Redhead math just kicked in and told me that half as bad minus half true equals a pretend Hostess Chocolate Cupcake. I was not allowed Hostess or Little Debbie type products as a kid. Being bared from such cream-filled and frosted wonders likely explains my peculiar personality and behavior. No, wait, the red hair and the ovaries explain that. 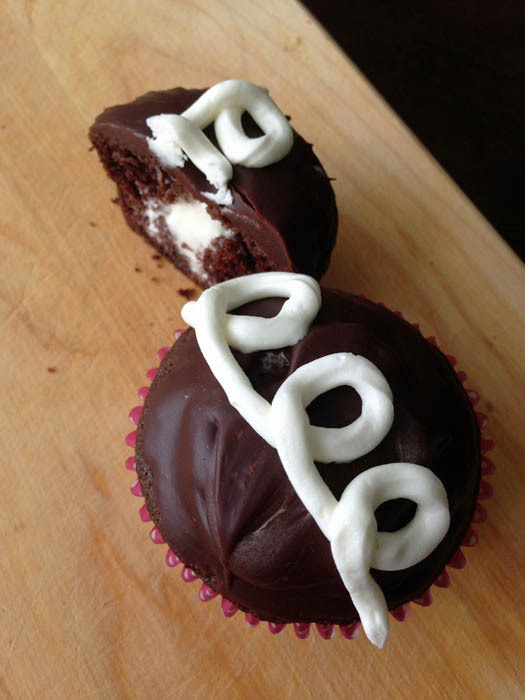 What it does explain is why I was out the door and at the store buying marshmallow fluff the moment I saw these Homemade Hostess Cupcakes on Pinterest. When I clicked through and it took me to the Novice Chef blog, I knew this would be a winner. Jessica has already provided me with the closest thing to a Lofthouse Sugar Cookie I’ve ever made and the best Iced Oatmeal Cookies of all time. This recipe might look intimidating at first because there are four components: cake, filling, chocolate icing and vanilla icing, but each step is pretty basic. You’ll notice the directions are actually shorter than the ingredient list. The only annoying part is waiting… waiting for the cupcakes to bake, waiting for the cupcakes to cool, waiting for the chocolate icing to set. But I make the most of that time by CLEANING up after the cake mess I’ve made. Ok, actually I lied, the annoying part is the chocolate icing. 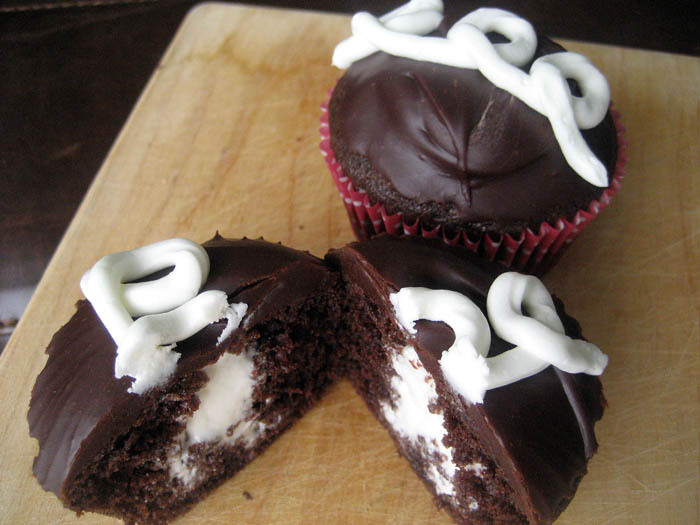 When I dipped these in the warm chocolate icing, it sometimes sucked the marshmallow filling out of the top as I pulled the cupcake out and then I’d have a little white tie-dye effect on top or even some filling floating in my pot of chocolate icing. Perhaps I overfilled my cupcakes? Used too shallow of a pot? Either way, I ended up using a spoon to pour the icing over the top of the cupcake and smoothing it with the back of the spoon. 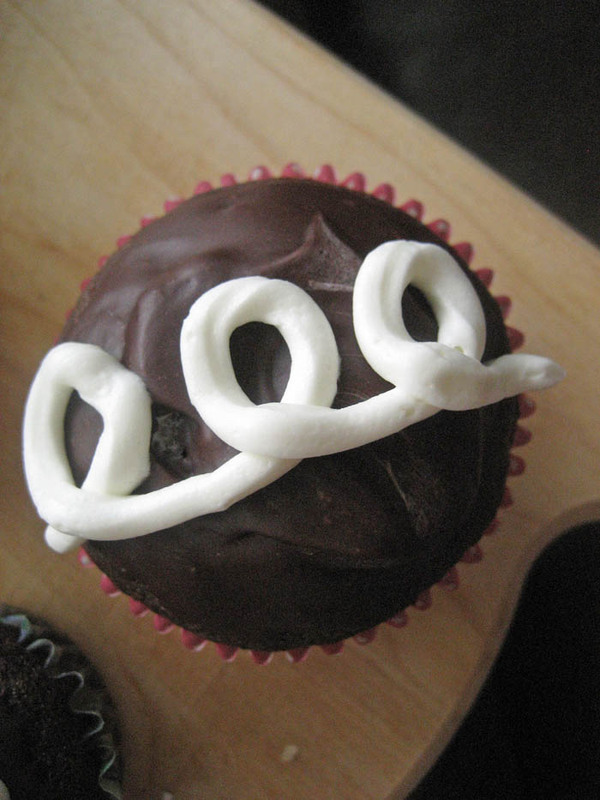 This icing smooths over nicely, so don’t be afraid to make touchups. Per my opening statement, these do not taste identical to the real Hostess Chocolate Cupcakes, but they are still very yummy. How do I even know what the real thing tastes like if I wasn’t allowed such things as a kid you ask? That’s what elementary school BFFs and gas stations are for. Preheat oven to 350°F. Line a muffin tin with cupcake liners. Stir together flour, cocoa, baking powder, baking soda and salt in medium bowl. Set aside. In a large bowl whisk egg, sugar, oil and vanilla; stirring till there are no lumps. Then add flour mixture, alternating with milk, until you have a smooth batter. Fill cups 2/3 full with batter. Bake 20 to 22 minutes. Remove from oven and allow to cool completely. Using a stand mixer, cream the butter until light and fluffy, about 2 minutes. Beat in confectioners’ sugar. Add the vanilla and milk and beat until smooth. Beat in the marshmallow creme. Transfer filling into a pastry bag with a long filling tip. 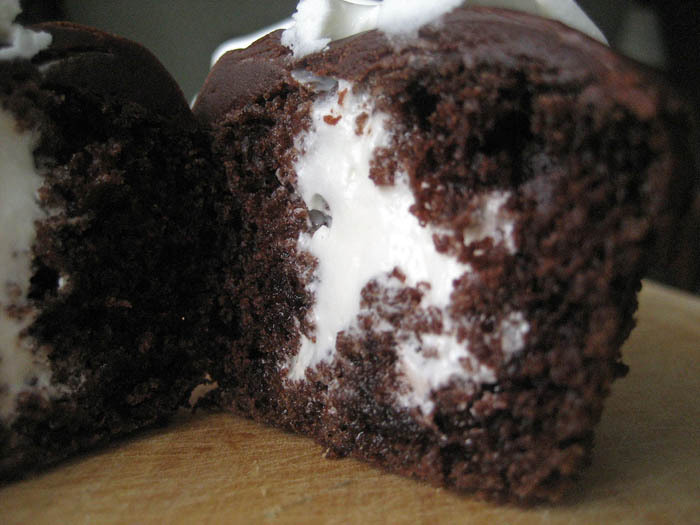 Insert the tip into the center of each cupcake and fill until the cupcake is slightly heavier. It’s OK if some of the filling peeks out a little, it will be covered by the chocolate icing layer. In a small saucepan over medium heat, melt butter. Add milk, corn syrup and chopped chocolate, stirring slowly to allow chocolate to melt completely. Once melted, remove from heat and whisk in sifted powdered sugar. 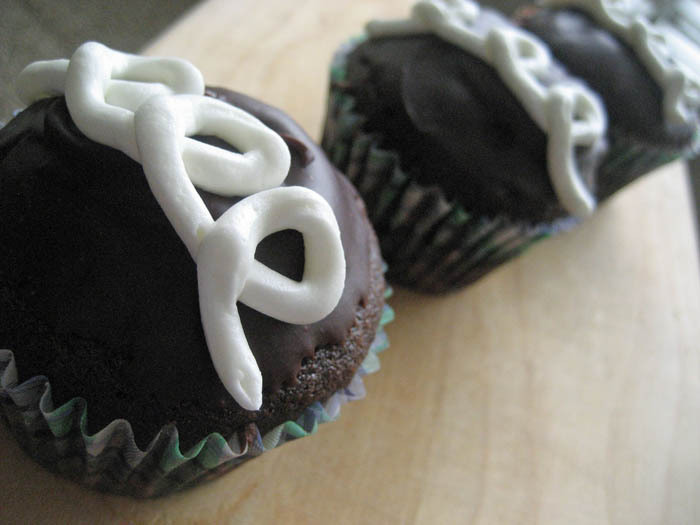 Immediately dip the top of each cupcake into the icing and transfer to a wire rack. Let icing set (about 10 minutes), before moving on to the next step. Using a stand mixer, cream the butter until light and fluffy, about 2 minutes. Beat in confectioners’ sugar. Add the vanilla and milk and beat until smooth. If the icing is too stiff, add in a little more milk. Transfer icing into a pastry bag with a small tip. Pipe in a swirl decoration on top of the cupcakes.